There are few children in Italy who do not grow up eating Pastina, the classic tiny pasta stars that parents first serve as a child’s introduction to the delicious world of pasta. 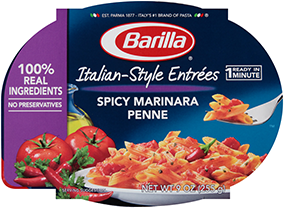 Barilla® Pastina is made with non-GMO ingredients. For more information, please read our position. Here in America, parents choose Barilla Pastina for their young children because it is made from 100% highest quality durum wheat; is enriched with essential nutrients, such as thiamin, iron, riboflavin and niacin; and is easily digested. Grown-ups love the deliciously nutty flavor of Barilla Pastina, too, especially in soups and simple broths.